Smriti Irani Or Husband Zubin Irani, Who Captioned Her Throwback Pic Better? 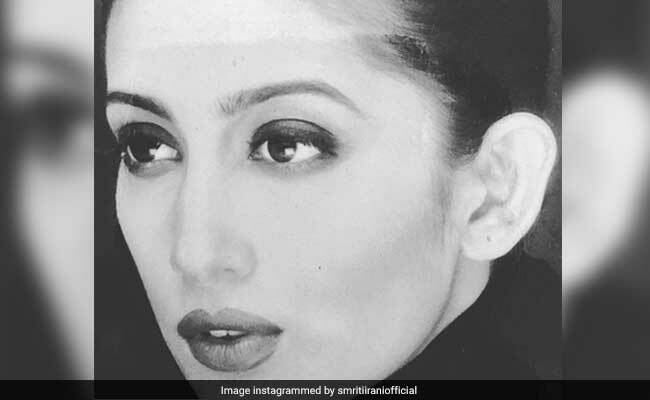 Union Textiles Minister Smriti Irani delighted her fans by sharing a stunning throwback picture from her modelling days on her Instagram profile on Thursday. The picture is a greyscale close-up shot from one of Smriti Irani's photoshoot (going by the caption). The Union Minister captioned the post: "Kyunkii mera bhi kabhi photo shoot hua tha." The picture was initially shared by her husband Zubin Irani a few days ago on Instagram along with the caption: "Gothic looks of the quintessential Indian housewife." It is difficult to say whose caption was the winner but there is no denying the fact that Smriti Irani looks absolutely stunning in the picture. Smriti Irani frequently treats her fans by sharing several throwback pictures on her Instagram profile. The Union Minister is often seen reminiscing over her Kyunkii... Saas Bhi Kabhi Bahu Thi days. Remember the post in which she thanked her show's director and friend Ekta Kapoor for believing in her and wrote: "18 years ago began a journey that changed my life forever Ekta Kapoor you believed in me when no one wanted to take a chance." In July, Smriti Irani shared a picture of her husband along with Shah Rukh Khan, which was apparently taken during Akash Ambani and Shloka Mehta's engagement party. Smriti captioned the post: "And, they say only women gossip." Smriti Irani made her television debut with Ekta Kapoor's popular television show Kyunkii...Saas Bhi Kabhi Bahu Thi, in which she played the role of Tulsi Virani. She also featured in shows like Hum Hain Kal Aaj Aur Kal, Thodi Si Zameen Thoda Sa Aasmaan and Virrudh among others. Smriti Irani married businessman Zubin Irani in 2001. She hasn't starred in television shows or films after she joined politics. She almost starred in Umesh Shukla's All Is Well but gave up the role due to her work commitments as a Union Minister. Later, Supriya Pathak was roped in for the role. Whose caption did you like better? Tell us in the comments section.